Fleas are some of the more common pest we experience in central Texas. There are many different types of fleas, such as cat fleas, dog fleas, human fleas, rat fleas, and many more. Fleas are very important to control in your environment not only because they bite, but they are known carriers of certain diseases and act as intermediate hosts for different types of tapeworms. Fleas can occur in homes and buildings even when no pets are present or the structure has been vacant for up to six months only to attack the next visitor that arrives, human or animal. Deer, Varmint and Rodents are big carriers of fleas and can greatly contribute to flea problem in and around structures which is why control of wildlife is extremely important to consider when trying to eliminate a flea infestation. Flea eggs can be laid anywhere inside of a home, but are most common to the host, bedding areas, and carpet. Treatment of fleas can very tricky due to the lifecycle of a flea and the places they hide. Wildlife present on the property as well as other conducive conditions can present added challenges to a flea control program and must be addressed properly. The use of a properly labeled pesticide and Insect Growth Regulator by a licensed applicator both indoors and out is usually the only remedy for an established flea infestation. A sucessful treatment program is a combination of efforts by the home owner (see treatment forms page for "Flea Treatment Instructions) and the pest control operator. 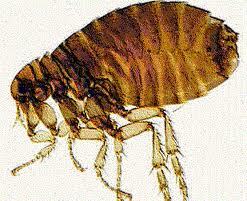 For additional details and pricing on flea treatments or what can be done to prevent a problem please give us a call. We would love to help in any way.